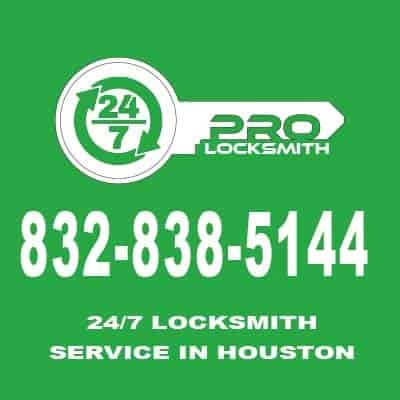 Pro Locksmith in Houston is a local company serves Houston Texas and Harris, Fort Bend, Montgomery Counties 24/7 . We offer the top quality automotive, residential, commercial and emergency services from our fast response mobile technicians. We provide home locksmith & security services, lock change, emergency house unlocking, lock re-key, maser key system and more. Call us for a free estimate. 24/7 car lockouts, car key made, ignition lock replacement or repair and more. For more info click the button below or call us now. We offer commercial locksmith services 24 hour a day 7 days a week such as Master key system or push bar installation. Call us for commercial locksmith consulting. Pro Locksmith works round the clock to make sure that the individuals in the vicinity of Houston are supplied with 24 hour locksmith services for houses, automobiles, and companies. For many cellular services, we have an extra mobile charge of $19, or $29, depending upon your location relative to downtown Houston, TX. Furthermore, every lock which we install or replace is supported by a written guarantee. To put it differently, you've got 90 days to tell us whether the lock wasn't replaced or installed correctly, and we are going to send the tech straight outside to fix any errors at no cost. We unlock houses, bathrooms, cabinets, vehicles, glove compartments, offices, restaurants, government buildings, storage units, sheds, file cabinets, bike locks, and nearly anything and anything which has a lock! For service today, phone Pro Locksmith in 832-838-5144! Pro Locksmith is local Locksmith company proudly serving Houston Texas and surrounding areas. We choose our employees well. Before we hire any of them, they are screened for drugs and we check their criminal background as well as their driving records. We have a state of the art training facility to train our new employees as well as update the old ones with the latest in locksmith technology. We take pride on servicing more than a thousand clients all over Houston, Texas for more than 15 years now. A lot of car owners in Houston TX and in other places all over the world would often make the most horrible mistake of leaving their car keys inside their car. This is definitely one of the most disappointing experiences that a car owner would have to go through. In times like this, all you need to do is to call us. We provide car locksmith Houston TX services and in nearby cities as well. The moment you call us, we will immediately ask our staff to go to the area where you are at and they will solve the issue for you as quickly as possible. We can assure you that our locksmiths are highly competent and they can take care of all issues concerning your car’s locks and keys and they will make sure to resolve it at the earliest possible time. There are various residential locksmith services that we can provide you and this will vary from the simplest problems to the very complex issues. We certainly understand how important it is to address issues concerning your door locks at home. In order to make sure that your emergency problems will be addressed in a timely manner, we offer a fast response time. So if emergencies will occur and you need a residential locksmith Houston professional, all you need is to call us. Our quick response team will go to your place as soon as possible and resolve your problem in no time. Securing your commercial property is absolutely important. As you know, if the safety and security of your business are compromised, then you could end up losing all your investments and this could lead to the downfall of your business. So if you need a commercial locksmith Houston TX professional, then call us. We provide a wide range of commercial locksmith services to keep your business protected. Aside from installing indoor and outdoor locks, we also provide repair services for key-less entry systems such as bio-metrics, card access systems and many more. Whether you are stranded outside your house, office or car, or perhaps you found yourself in need of a reliable and professional locksmith services, Pro Locksmith team is always at your service. We are 24/7 locksmith services and we are prepared to attend your needs. Pro Locksmith provides quick professional solutions wherever you are located. Whenever you need us, we have a locksmith experts ready with the solution you need and the service you deserve, quickly and professionally. All of our locksmith specialists at Pro Locksmith are fully trained and highly skilled in order to offer you the best immediate locksmith services when you need them. We are prepared to attend each and every call. We are one of Houston biggest groups of locksmiths offering all kinds of locksmith services all over the city. We have been in the business for more than 11 years now and we take pride in offering excellent quality of service and customer satisfaction for all your locksmith service needs. We have developed a reputation for providing services in a quick and professional manner and today, we are known as the most trusted locksmith in Houston. If you are in need of locksmith services, then you have come to the right place! We are a company that offers high quality and affordable locksmith services. We are in the business for so many years now and we can assure you that we will provide reliable locksmith services, whether it is residential, commercial or auto locksmith services.